We brought Levi home from Idaho when he was small, just 12 weeks old. He was that puppy all the books say don’t get. Don’t get the one that runs and hides under the table. Yup, that’s what my little baby boy Levi did. But when he got home, he was better… so I thought. But he was insecure, and the training center said he could become a fear biter. Well, after much socialization, training, and love, Levi is sweet as pie. 🙂 He was my first agility dog, and he has more titles than I can shake a stick at! He’s my Soul Mate Dog, too, and I love him with all my heart. I messed up Levi’s weaves in agility, though, but that seems mostly fixed now. To follow Levi’s training click here! 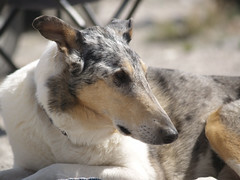 Levi is a smooth coated blue merle collie. He loves agility, herding, camping, and hiking. He’s does dog sports with the AKC, NADAC, USDAA, and DOCNA. He also herds in ASCA and AHBA, and he’s a member of the AWCA and has his AWCA Versatility Title! –Levi died on February 23, 2012. Levi was my heart dog, and took a big chunk of my heart with him when he went. He was no longer able to stand, or go out to potty, and he was in a lot of pain. So we had to let him go. I will miss you forever, my sweet Levi. What a beauty! I’m in love! OMG!! That is an amazing pic!!!! He looks like he is just loving life flying over that jump. I love it! Wow, nice pictures! He looks like he’s enjoying his self! I love coming across other Smooth Collie owners that do Agility. I compete with my girl Holly and have made it to Excellent in AKC and Elite in NADAC. There is no DOCNA near us so we don’t do that. My girl also loves to hike. We had a litter four years ago and one of the pups was a Blue Merle male named Levi. He went to a show home in Canada and has his American and Canadian Championships. Hi Mike nice to meet you! I also love seeing other collies in agility. They are pretty rare here in Utah. Levi’s a fun name for a blue smooth. 🙂 I didn’t name him.. his breeder did, but I kinda like it. How mant ribbons does he have??????? ?